The Root Chakra is located at the base of our spine. It is the ‘root’ of our being and establishes the deepest connections with our physical body, our environment and the Earth. Muladhara is the most instinctual of all the chakras – it is our survival centre. 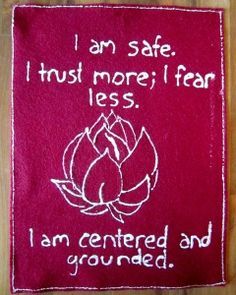 The First Chakra is responsible for our sense of safety and security on our journey through life. Balancing the root chakra creates the solid foundation for opening the other chakras. Imagine that you are laying the foundation for a house in which you are going to live for along time. A solid foundation embedding firm soil will provide the stability you need to create a home filled with joy for years to come. The root chakra is comprised of whatever grounds you to stability in your life. This includes your basic needs such as food water, shelter. As well as your emotional needs, such as letting go of fear. When these needs are met, you feel grounded and safe. If there is an imbalance in the 1st chakra you may experience anxiety, fears or bad dreams. Physical imbalances may arise, such as problems in the colon , the bladder, lower back, legs and feet. Eating disorders may also be a sign of a root chakra imbalance and an unhealthy immune system. The Root chakra energy is ‘Tribal Power’. It is our connection to traditional familial beliefs that support the formation of our identity and sense of belonging to a group of people. The root chakra energy manifests in our need for logic, order, and structure. The primary fears of the root chakra are, fear of physical survival, abandonment by our family, our friends, co-workers or partners. This chakra is where our ‘conditioning’ originates. Tribal attitudes, such as what we are taught is right or wrong by our parents, grand parents and so on. The immune system, which is governed by the root chakra, does for the physical body exactly what the tribal power does for the group; it protects the entire body from potentially damaging external influences. Difficult challenges within our tribe cause us to lose power from our first chakra, making us susceptible to immune-related diseases, from the common cold to the extreme. We are taught over time to make choices that meet with tribal approval, such as the manner of which we dress. Within us we have a relentless desire to explore our own creative abilities, to develop our individual power. This desire is called ‘becoming conscious’. It is extremely challenging, and often very painful – to begin to evaluate our own personal beliefs and separate ourselves from those that no longer support our growth. Change is the nature of life, and external and internal change is constant. When we change inwardly, we outgrow certain belief patterns and strengthen our own. Every time we run into a new crisis or crossroad it means we can enter into a new cycle of change. Sometimes that ‘change’ means letting go of familiar people and places so we can move on to another stage of our life. This is a scary new world, and we may be afraid to enter. We want to become more ‘conscious’, but at the same time we are fearful of what that might mean to us. Ask yourself these questions. Perhaps you may want to journal your answers. Take some time to think about he questions from a deeper level than the surface of yourself. 2. Which of those belief patterns that still have authority in your thinking can you acknowledge are not longer valid?